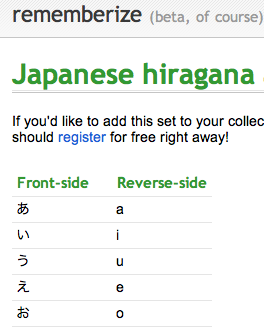 This is the first flash-card style web2.0 application I have seen. Recently West Australian University graduate Kyle McLuckie invited me to test his new app - Rememberize. It is quite a simple tool (in the vein of 37signals web2.0 apps) for creating and learning sets of cards. The site itself is at http://rememberize.com, and the blog post announcing it can be found at http://blog.rememberize.com. If it’s useful enough, I think it also has the potential of being useful social software – facilitating conversations with those interested in the same subjects. If you have the time or interest, please, have a look at it. If you have any comments, I’d love to hear them. …. essential in the education of writing and computer skills in primary schools. It anticipates on the growing interest for the development of the motor system connected to the education of handwriting. 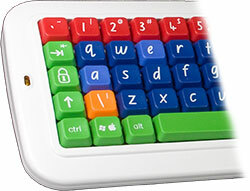 Moreover, this attractively designed keyboard stimulates young children to get acquainted with computers in an educational way. ….. explores how education networks are creating and sharing knowledge. The conference features a great line up from school presenters to e-learning experts and covers topics ranging from online competencies to digital literacy, blogging and podcasting. Have you ever recorded an interview in which you and your guest ended up at different volumes? How about a panel discussion where some people were close to microphones and others were not? These are the problems the post-production engineers of Team ITC solve every day, and it used to sometimes take them hours of painstaking work with expensive and complex tools like SoundTrack Pro, Audacity, Sound Forge or Audition to solve them. Now it takes mere seconds. Seriously. The Levelator is unlike any other audio tool you’ve ever seen, heard or used. It’s magic. And it’s free.